The Oxford English Dictionary tells us that the word "ghost" appeared as early as 900 AD as gast. A gast is a spirit, or as the OED tells us, a "principle of life." "Agast" or "Aghast" thus signals a reaction upon seeing a "gast" -- white knuckles, quickened heartbeats, uncontrollable sweating become evidence that someone has taken fright at an apparition ... that someone has seen a ghost. For his book Spectral Evidence (2005), critic Ulrich Baer explains how photography facilitates such a reaction. He notes how "In the photograph, time itself seems to have been carved up and ferried, unscathed, into the viewer's present". A photograph therefore does much more than provide evidence of something that happened a long time ago. A photograph is a record, yet it is also a form of transport, a conveyance that interrupts and forces the spectral traces of a forgotten past into a familiar present. Architectural discourse has made similar use of photography. A photograph of a building in a book or magazine guarantees architecture's afterlife. A picture ensures that a tabled project, bombed-out residence, or failed city plan will live past its own death. A photograph also becomes the primary means for transmission of an idea for a building. A case in point would be the various photographs of Mies van der Rohe's Farnsworth House appearing in various publications in the 1950s -- these images would be an important point of reference for the Smithson's Hunstanton School (1949-1954). But consider a more controversial example -- Philip Johnson's Glass House in New Canaan, Connecticut (1949) . Though Johnson was no doubt familiar with the photographs of the Farnsworth House in publications, he famously quipped that his house, with its abstracted frame and dominating central hearth was inspired by the ruins he saw in 1939, as a correspondent following Wehrmacht troops as they crossed into Poland. The Glass House then operates in a similar fashion as a photograph -- the building's imageability not only records a Miesian precedent, but also suggests the idea of something that happened before. But this is only to reaffirm that photography's promises are twofold: in addition to a guarantee of an eternal life of sorts for architecture, by preserving its forms and volumes for future consumption, photographs also help disseminate a rich visual record to be adopted by generations of future designers. But an architectural photograph can also cause someone to take fright, to become aghast. A case in point would be the photographs of Frank Lloyd Wright's Midway Gardens (1914, demolished 1929). A few remaining photographs show Wright's European-inspired garden teeming with people. One of these captures a vibrant night scene (image at top). A throng of impeccably-dressed men and women sit around tables, laughing and talking. In the background, Wright's architectural gestures are visible. A series of flat-roofed buildings with large balconies act as framing devices. 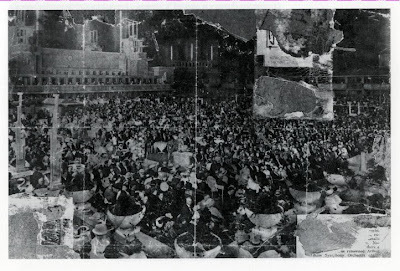 And this photograph was most likely taken from such a balcony. The Gardens become a series of overlapping landscapes. Planar surfaces and shallow-roofed follies give way to throngs of people. And in the distance, an orthogonal band shell covers a tuxedo-clad band as they play to the crowd. Yet this photograph has a touch of the spectral. A strange, glowing haze outlines the lightposts and buildings in the background. And if one looks carefully enough, behind these, a ghostly building with an arched facade can be seen emerging from the darkness. Another photograph shows the Midway Gardens from a different angle. Here, the photographer would have most likely been to the right of the bandshell, capturing images of a large structure that would have sat to the left of what the first photograph depicts. The second photograph, with its larger depth of field, captures more people and more architecture within a single frame. Here, however, there is very little night sky. As in the first photograph, lightposts create an eerie, incandescent haze, a diaphanous film that nevertheless manages to cast harsh shadows on the buildings in the rear of the photograph. This is all, of course, secondary to what is perhaps the photograph's most glaring aspect: its obvious state of decay and disrepair. We know, of course, that supervening economic circumstance and dwindling public interest led to the demolishing of Wright's gardens. But there is something about the shoddy state of this photograph that really causes to take fright at such decay and disrepair. It is as if the careless folds and creases, the glue stains and water marks that delimit areas of neglect across the image suggest the Midway Garden's ultimate fate. Wright's building, much like this image, is a forgotten object, an architectural tchotchke folded, creased, and stuffed into some cobweb-ridden corner of an amnesiac mind. These two photographs of Midway Gardens are also startling in their depiction of people long dead and gone. Faces and body gestures invite speculation. These people could have been anyone. But notice how some of them look back at the camera, aware of the phosphorous flash that will forever freeze the image on a photographic plate. One person is even captured mid-bite. Another looks up momentarily as he reads a newspaper. If these images were taken a day, or even a second later, a totally different image would have been captured. These are captured moments as fleeting as the architecture that encloses them. Consider the ghosts in another photograph, taken sometime in the early to mid-1930's, inside the Tokyo Golf Club. The room is crowded, visible with wood framing and columning familiar to vernacular Japanese architecture. 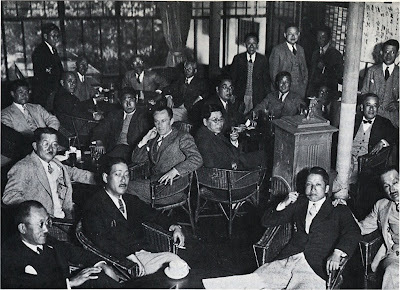 A group of well-dressed Japanese males stare confidently at the camera, drinking and smoking. 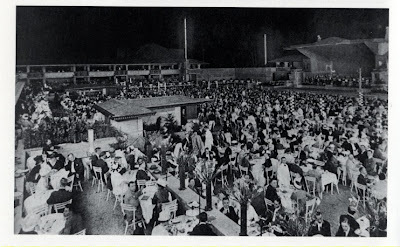 Towards the middle of the picture is Czech-born architect Antonin Raymond (1888-1976), who would design the modern addition to the Club in 1931-32. Raymond worked with Wright for the designs for the Imperial Hotel in Tokyo, and his subsequent designs combined modernist volumetrics and surfacing with Japanese architectural detailing. And here, in this photograph, Raymond's downward gaze is remarkable and startling, perhaps capturing a moment of deep introspection or even shame. A little over 10 years later, in 1943, the U.S. Army's Chemical Warfare Service would hire Raymond to design a series of "Typical Japanese Structures" in the Utah desert. These buildings, known as "Japanese Village" would be used to test the efficacy of the Army's new line of napalm incendiary bombs. It would not be hard to imagine that the very people sitting around napalm would perish years later as part of the firebombing of Japan -- a project that, quite strangely, relied on Raymond's architectural expertise. The photograph certainly calls to mind an image from popular culture -- the last shots of Stanley Kubrick's The Shining (1980). 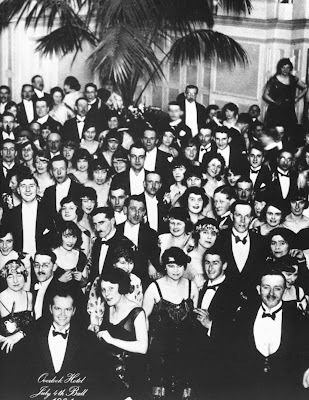 As Al Bowlly's "Midnight, The Stars and You" plays in the background, the camera closes in on an image of the main ballroom in the Overlook Hotel, circa 1921. Jack Nicholson's face is immediately recognizable. His toothy stare is more shocking than Raymond's gaze. Moments before, the camera trained on Nicholson's dead body in the middle of a snowy garden maze, his face covered with layers of frost. The final image of the film -- an image replete with architectural extravagance -- certainly echoes the photographs of Midway Gardens and the Tokyo Golf Club. All of these images capture moments from a distant era. Unlike the image from the Overlook hotel (which uses musical accompaniment to nostalgic effect), the Midway Gardens and Tokyo Golf Club seem mute. All images, however, are unified in their ability to capture the stares and voices of the dead. Here, through the medium of architecture, we have seen a gast. Hamlet, original spelling: "the air bites Shroudly"
If I could have one building back in Chicago, it would be Midway Gardens. What a gem...destroyed by prohibition.